Only a few minutes from the Alaska Highway that passes through the park is the serenity and seclusion expected in this area of the north. Some of the most outstanding views of natural beauty anywhere can be experienced at this park. Spectacular folded mountains, bountiful wildlife, brilliantly-colored wildflowers are just a few of the wonders to discover here. In the southern portion of the park, you will see the very impressive geological formations of Folded Mountain towering above the road. Tectonic deformations have folded the limestone giving these mountains their unique appearance. Further along the highway you will have the opportunity to travel across the alluvial fans. Caution should be used if investigating these wonders of nature. Rain high up in the mountains may cause flooding of these areas with little or no warning. Keep an eye open for moose which frequent the many swamps within the park. Twelve kilometres of jade-colored water will tell you that you have reached Muncho Lake. You have the choice of camping at Strawberry Flats campground or at MacDonald campground, 11 km further north. 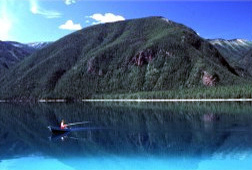 The lake’s cold, deep waters, tinted green by minerals, are home to lake trout, arctic grayling, bull trout and whitefish. Toss out a line and try your luck. There is an excellent chance you will see stone sheep along the highway. Be sure to check your rear-view mirror before hitting the brakes and give motorists’ ample warning of your intention to stop. The natural beauty of Muncho Lake Provincial Park is sure to be the highlight of your northern adventure. Please note: Camping fees are payable in cash only at the park. Gate is closed during the off-season; when snow falls. At km 681 of the Alaska Hwy. History: European discovery of the area did not occur until the late 1800s, when trappers, traders and explorers passed through the area. It wasn’t until the building of the Alaska Highway, that the face of Muncho Lake changed dramatically. There are still remnants of the construction features, such as wooden culverts and corduroy roads within the park. Cultural Heritage: It is believed that the Kaska Athapaskan Indians camped regularly in the Muncho Lake area. Conservation: Spectacular folded mountains and brilliantly-colored wildflowers are just a few of the wonders to discover here. In the southern portion of the park, you will see the very impressive geological formations of Folded Mountain towering above the road. Wildlife: Bountiful wildlife can be seen in this park. Keep an eye open for moose which frequent the many swamps within the park, also cariboo. There is an excellent chance you will see Stone sheep along the highway. Reduce your speed when animals are on or near the highway and pull well of the traveled surface of the road if you are photographing them. Fishing for lake trout, arctic grayling, bull trout and whitefish is available here. Anyone fishing or angling in British Columbia must have an appropriate licence. The park is open to hunting. All hunters to the area should check the BC Hunting and Trapping Regulations Synopsis for more information. There are SCUBA diving or snorkelling opportunities in Muncho Lake. Swimming is allowed in Muncho Lake. There are no lifeguards on duty in provincial parks. There are waterskiing opportunities on Muncho Lake. There is no viewing platform but there are wildlife viewing opportunities in the park. There is a boat launch at this park. There is a privately owned lodge on Muncho Lake. Hand pumps are located throughout the park. The hand pumps are shut off during the off-season. This park offers vehicle accessible campsites on a first-come, first-served basis – campsite reservations are not accepted. Camping fees are payable in cash only at the park. BC Senior’s Rate (day after Labour Day to June 14 only): $6.50 per senior party/night. Read the User Fees Policy for information on Senior Camping Discounts. There are wilderness, backcountry or walk-in camping sites available. There are wheelchair accessible opportunities in this park.